Mind boggling views stretching over Petone and Wellington Harbour, with the City proper in the background. . Regular sightings of cruise ships entering and leaving the harbour. Barely 10 -15 minutes will get you to the start of the Lambton Quay golden mile, the Beehive, the InterIsland ferry terminal and the main regional train and bus depot of the capital city. Petone and Hutt train and bus stops, as well as the Hutt Valley CBD, are 3-4 minutes away by car or a 20-minute stroll. The living area is on the first level and is open plan. A stone benchtop island allows one to prepare meals facing the panoramic views, or simply partaking with family and friends while lounging and enjoying the sights of the harbour and valley and the capital.Widescreen TV with SKY digital are in the area. The full kitchen has all the mods cons, and the whole area is kept warm and cozy by a heatpump. A smartly-tucked in laundry has washer and dryer wi fi is available. A twin bedroom is located in the first level behind the living area, adjacent to the main bathroom and toilet. There is also a media room, which can be used as a family area. The second level has the master bedroom with its own ensuite and a queen bed. The other bedroom has twin beds. Access to the townhouse is by 35 purpose-built steps from a newly-built driveway and off-street car park. Smoking allowed outside only. Access is down about 35 steps. No pets. Minimum stay 2 nights. Special rates for extended stays. 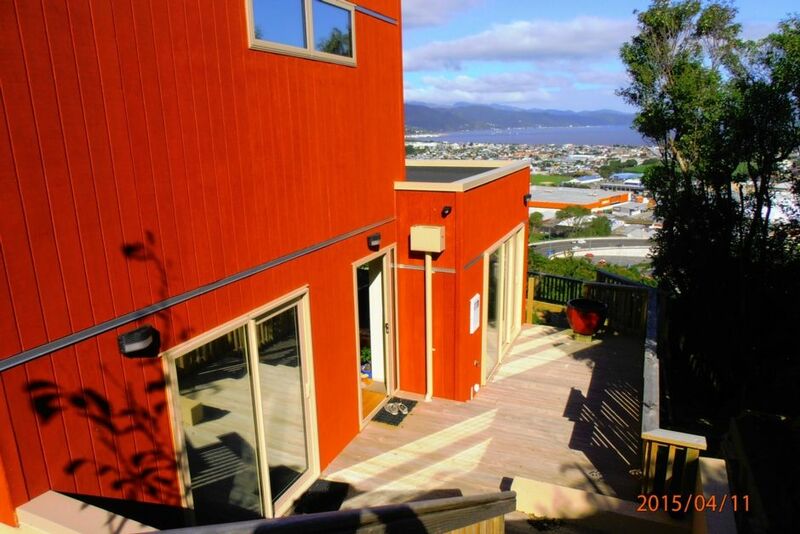 Everything we wanted and more - affordable, great space and spectacular views. Great communication and the owners are absolutely lovely to deal with. Recommend again and again! We Loved this house. Amazing view and very warm during our winter stay. Would love to stay again but did think it needed to be cleaner. There was rubbish and dust under beds and windows had lots of greasy finger marks . The owners are older so we realize those jobs might be a bit difficult. It didn't prevent us from loving our stay. We enjoyed the beautiful view from the property. We enjoyed the beautiful view from the property. The house met our needs for our family during our long stay. wonderful place to have a family holiday, clean tidy house, and plenty of room.